This year, for the second time, we are selecting wool from coloured Polwarth sheep for our Rough Ridge yarns. The wool comes from Fine Fibre Farms where Stuart and Sue Albrey have a large flock of coloured sheep who produce marvellous fleeces. The coloured fleeces are sought after by spinners and weavers. 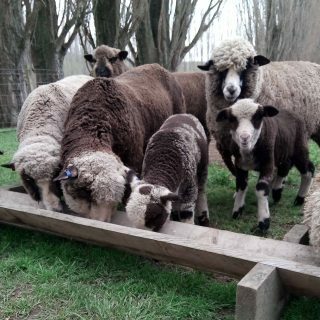 Stuart farms several different breeds of sheep, but the wool we love for our yarns is Polwarth. 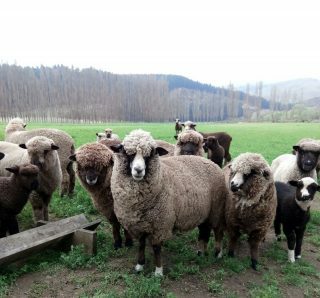 The Polwarth breed: Originally the Polwarth was bred from Merino and Lincoln breeds, then bred back to the Merino, resulting in a sheep that was ¾ Merino. The Polwarth breed was stabilised and is now recognised for its soft, sleek fleeces. It is not easy to find superb coloured fleeces in the quantities we need, so we really value being able to acquire this wool from Stuart. 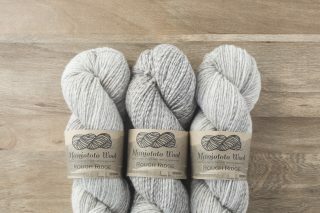 The wool is the perfect match for the merino cross wool that all the Maniototo Wool yarns are made from. 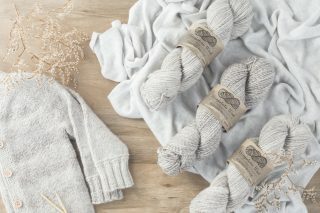 We use only a small percentage of coloured wool in the yarns – just enough for their unique heathered look and wonderful softness. Farm Visit: Yesterday we went to Fine Fibre Farms to select the Polwarth wool for this year. Stuart separates the wool into broad colour categories before it is sent to be scoured. We were able to select an amount that was a wonderful mix of colour but leaning towards a warm grey – perfect for our Rough Ridge yarns. Spring is in full flight at the farm. 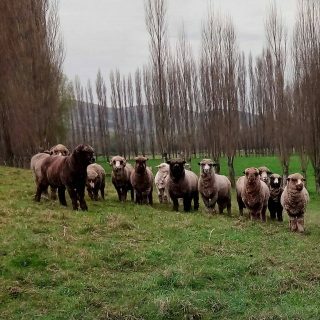 The main flock of ewes with their 2 – 3 week old lambs was grazing on the hills behind the woolshed – but we got to see a few special sheep…… Stuart is currently preparing some of his ewes and lambs for the Christchurch Show in November – about 6 weeks away. We walked across the paddocks to cast our eye over the sheep that Stuart hopes will win prizes at the show. To get to the ewes we walked through the ram paddock. The rams came trotting towards us in the hope that we would have some sheep nuts for them. There were several breeds of coloured rams, all looking large and healthy, and being well looked after until their services are needed in about 6 months’ time. The Show Sheep: A couple of paddocks away, grazing on a crop of lucerne were the potential prize ewes and lambs. We scattered sheep nuts into a trough and the sheep trotted over, allowing us a closer look. There were the big bodied Romneys with their round woolly faces and the finer Merinos and Polwarths. The main flock had been shorn but these sheep still wore their full fleeces in readiness for the show, and will be shorn afterwards. Some had twin lambs. I took so many photographs. Hope you like them……………..